Adopt-a-School hasn't added a story. There are two extremes at Maple Ridge Secondary: Kids whose families are living the suburban dream and those whose parents struggling to put food on the table. Principal Trevor Connor estimates at least 60 students come to school hungry because there is no food at home, which means they don't have anything for lunch either. Two years ago, the nearby Alliance Church started an emergency breakfast program that was expanded last year to three days a week thanks to an anonymous donation to Adopt-a-School. If we can raise another $10,200, kids could have a hot breakfast every day -- pancakes and sausage or an English muffin filled with ham, cheese and egg or French toast. Plus they get fruit and a juice box. For the breakfast program, the school also needs a dozen volunteers. And then there's lunch. Lunch is served at the school, but it costs $5 for a hot meal and $4 for a sandwich. Staff have taken on the burden fundraising to pay for sandwiches for kids who can't afford it because they can't bear the idea of well-fed students eating while other from impoverished families sit hungry. In addition to money for the breakfast program, the school is asking for $2,000 for an emergency fund to buy students clothes, shoes or bus tickets. “We have families who need hampers at Christmas and parents saying, ‘I’d rather have bus tickets for my kids.’ So we put bus tickets in the hampers. It’s very hard for these families,” said Connor. So we told her story, introducing readers to her children. And because you began donating money, clothing, school equipment and field trips, by the spring of 2013, the donations were close to $1 million to Adopt-a-School. 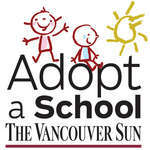 The Vancouver Sun Children’s Fund matched some of those donations for a total of $1.3 million. Because of you, hundreds of Vancouver-area schoolchildren now have boots to wear in the rain, warm breakfasts and are experiencing things they would never have otherwise. 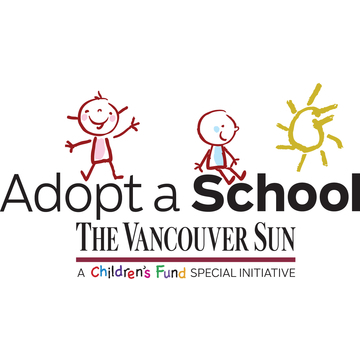 For more than three decades, you have enabled The Vancouver Sun Children’s Fund to raise than $11.5 million, of which more than $7 million has been distributed to nearly 1,000 non-profit children’s charities in B.C. The season of giving is once again upon us, and we're hoping you'll contribute to Adopt-a-School to keep alive this great legacy that we both started so many years ago. Adopt-a-School hasn't posted any updates yet.